The warm weather is finally here, meaning I can drink my morning coffee out on the balcony. Yay! And my plants are doing well so far. The basil sprouts just poked their tiny heads out of the soil this week, and the peas are really taking off. The pepper plant appears to be thriving—my first attempt at growing bell peppers, though other types have done well in containers for me before. And then there’s the geranium in the photo, of course—those are notoriously hardy. Decluttering madness continued this week, although not at the same pace as before. I have a ton of stuff to take to Goodwill, and I still have another closet to go through. But I’m more organized than I’ve been in a long time, and I feel a sense of relief at simply owning less. Now that most of the decluttering is done, I’m on to a serious spring cleaning of the apartment—getting the carpets professionally scrubbed, cleaning the windows and wiping down the windowsills, etc.—wiping away the cobwebs of winter and letting the fresh air in. On the writing front, draft three of “Good Old-Fashioned Magic” is off to beta readers. That was this week’s big task—doing yet another read-through and cleaning up the draft so it was as error-free as possible before sending it out. I didn’t wait my usual six weeks before the read-through, since I was mostly checking for typos and inconsistencies. With beta readers, I want them to be focused on connecting with the characters, examining the plot, etc.—not getting bogged down in typos and weird word echoes. So that story is cleaned up, sent out, and out of my hands for the time being. In the upcoming week, I plan to do a read-through of my novel “Made of Shadows” and begin revisions. I have a sneaking suspicion it might need a page-one rewrite, since it’s the first adult paranormal I ever wrote, but I’ll make that call after the read-through. I haven’t been doing as well with my social media goals as I would like. I’ve started using Pinterest regularly, but I need to remember to check in on Facebook and Twitter every day. And I’ve only been blogging once a week; I’d like to get that back up to twice. What about you? How are your goals, writing or otherwise, coming along? If you’ve planted a garden this year, how are your plants doing? A Round of Words in 80 Days is the writing challenge that knows you have a life. It’s also a blog hop. Click here to cheer on fellow participants. I’m coming back around. My theatre projects are in the final weeks before a 3 month hiatus that is to be a writing boost and reconnecting with the Hubs. Glad to her Good Old-Fashion Magic is going well and on a 3rd draft. Huzzah!! Last month was NaPoWriMo and Blogging fromn A to Z and that kept me pretty busy (plus the theatre stuffs). Actually got to catch up on housework today (despite the 85+ degree temperature here). Here’s to another good week!! Yes, I think April was a crazy month for a lot of people, especially with the A to Z challenge. Glad to hear you’ll have some breathing room soon. It’s good to have some downtime. My husband is in grad school and working full time, so I’m looking forward to the summer when all he has to worry about is work, since he’s not taking summer classes. It will be nice to relax together. Here’s to a summer of writing, Cindy! Your garden looks great! I have a garden too. In my front yard, because not even weeds really grow in my backyard. 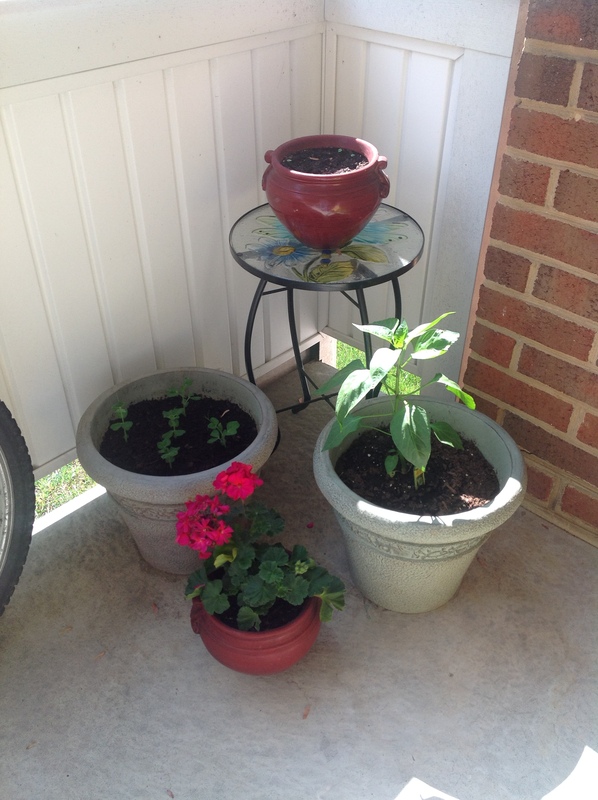 We’ve got some bell pepper plants (we grew some of those last year and they’re fairly easy), tomato plants, and a small flower bed. We had some questionable seed packets so we’re testing them out in tiny pots before sowing them. So far, the herb seeds look viable, but not sure about the pumpkin, watermelon, peas, and corn. Will know about those by the end of the week. I hope you get great and helpful feedback from your betas. I hope that even if it is a huge rewrite for your other project that there is at least some usable chunks to help you out. Keep up the great work! Thanks! Glad to hear that bell pepper plants are easy. I’ve grown chili peppers with some pretty good success, so I’m hoping these are just as low-maintenance. Let me know how your gardening adventure goes. When I lived in a house I grew watermelon one year and it was delicious–much smaller than the ones you can buy at the grocery store, but really good. I’m not much of a gardener, but helped DH plant some bulbs in the flowerbeds and they’re coming up nicely. And you gotta love the weather we’ve been having lately! Trying to enjoy it before it gets too hot and humid. Great work on your decluttering and the writing! The nice thing about bulbs is that most of them are fairly low maintenance. There are irises and daffodils growing around our apartment complex, and they seem to grow well without a lot of work. I’ve also been enjoying the weather. I try to spend each morning sitting on the balcony reading a chapter in a writing book. It’s a great way to start the day.